My cousins’ son just turned one and to celebrate, they held a “smash the cake” party along with one of their friend’s son who was alos turning one. Another friend who is a photographer came along and offered to shoot the party since she doesn’t have a lot of experience with this type of event. Now, I’m probably doing the wrong thing by posting a picture of my cousins’ friend’s son rather than my own cousins’ son, but I thought this picture was especially adorable. The whole cake-smashing party seems strange to me, though. I don’t remember my first birthday but I hadn’t previously heard of making the cake-smashing the point of the party. Everything is set up on a washable tablecloth and the baby is encouraged to smash the cake. Did I do that when I was one? This entry was posted in Uncategorized and tagged Babies, Baby, Birthdays, cake, One, Smashing by christao408. Bookmark the permalink. Gorgeous picture! I thought it was a picture of you (digitized and enhanced) hahahaha….I never heard of cake smashing either. Then again, I don’t go to a lot of baby birthday parties. Hmm I don’t remember doing this specifically, although I think I might have dunk my head into some food when I was little. Trying to remember, but I think I recall a picture of me covered from head to toe in something edible. I thought the baby was supposed to eat the cake. Heh… this is probably realistic. What baby wouldn’t want to smash a cake?? <g> Cute. Adorable, just makes me smile. I bought my daughter her own little smash cake for her birthday when she was one. I plan on doing the same for my son. It is very popular around here, they sell them as “baby smash cakes”. What beautiful eyes! I never heard of cake smashing, either, but it looks like the baby was having fun! i still do this…diapers and all. lol. j/k. never heard of this either..
Love the picture. Noah did that on his 1st birthday… except, he smashed it with his mouth and face first. Yes and No….You had your own cake and dug into it, as I recall, but you were sitting in your high chair. The point was for you to eat the cake, not make a complete mess of it. Of course, at age one your eating still consisted of eating everything with your fingers. Cake is particularly messy when eaten with one’s fingers, consequently the “smashed” concept. It’s probably a good thing that we don’t remember our first birthdays, regardless of one’s generation. Great photo!! Cake smashing is a child’s way of eating the cake. Chris, it wasn’t a party specific for cake smashing, it was a photo shoot. We met at a local park and took photos, that’s it. Both boys’ birthday parties were a few weeks later. It was just a fun opportunity to get some photos and an opportunity for the photographer to add them to her portfolio. I’ll bet most kids (at least American ones) got to eat/smash a birthday cake on their first birthday. I’d like to think it’s tradition. I have fond memories of Michael’s 1st birthday since Mom gave him a chocolate cake with chocolate frosting. I think most of it ended up on the high chair. I remember a cake-smashing event at my preschool. The concept was so foreign. I think I just stood there completely confused. @alextebow – Oooooh, I see. That makes more sense. Thank you for explaining that. I’m not sure how I got the idea that the cake smashing was the main point. Something new learned each day. @jandsschultz – Plus, we had that easy to clean orange linoleum so so that probably minimized the need of putting a tarp down! @sassyjessie – And, I imagine, most of the one-year olds for whom the party is held stand there (sit there?) confused as well. @Fatcat723 – That makes sense. @yang1815 – It seems smashing = eating at that age. @ZSA_MD – Bobbing for cake instead of bobbing for apples? @ThePrince – Yeah, you say you are kidding but you’re actually not! =P@nov_way – @New_Egyptian – @iskrak – Yes, I thought the baby’s eyes are really beautiful, too. @puella_sapiens216 – Maybe you only serve them the less than awesome ones? 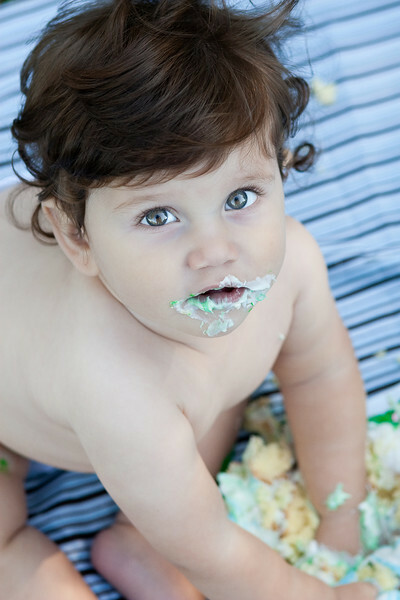 @fortheloveofblogging – I thought those were called “cupcakes” – ha ha ha…@Passionflwr86 – It seems that my cousin’s son was quite hesitant to handle his cake. He doesn’t like getting his hands messy. @Roadlesstaken – Covered from head to toe in something edible? There are probably several young ladies out there who would like to see a photo of you like that now. Ha ha! @ElusiveWords – There was a fleeting moment before I posted this picture when the thought crossed my mind that this baby could plausibly be me as a baby. My hair wasn’t so auburn colored, though. I love his eyes. Nothing as open, nonjudgmental as a child’s stare. @RushmoreJ – He’s probably wondering if mommy is going to scold him or not! @kunhuo42 – Not for the neater of eaters, that’s for sure.